Raspberry Pi Measurement of voltage and current at the 3.3V pin under load If you connect a 3.3V pin to the Raspberry Pi, then you expect a voltage of 3.3 volts. Unfortunately, the voltage and current behavior changes under load. How exactly can be determined with a series of measurements. If you connect a 3.3V pin to Raspberry Pi, then you expect a voltage of 3.3 volts. Unfortunately, the voltage and current behavior changes under load. How exactly can be determined with a series of measurements. The table consists of a total of 3 parts. The first part consists of the 3.3V (column 2) voltage applied to the 3.3V pin and a current from 0.001A to 0.016A (column 3). In order for the given current to be set below the specified voltage, a corresponding resistor must be used for this purpose, which was calculated for this purpose (column 4). 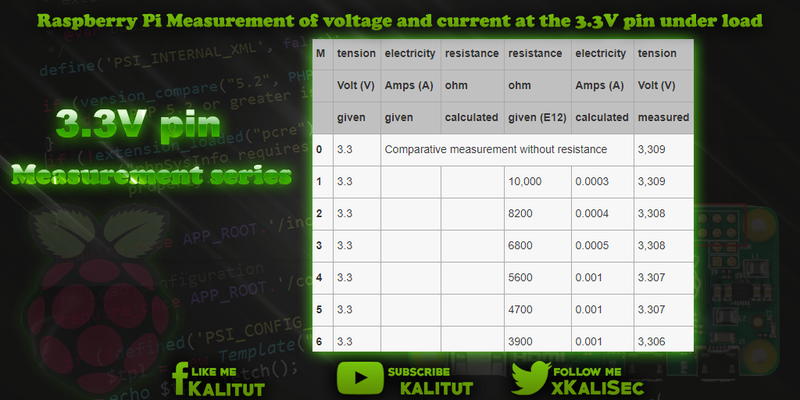 The third part of the table deals with the actual measurement of voltage and current (columns 7 and 8). Here, the voltage at the 3.3V pin was first measured (column 7) to see if there were really 3.3 volts across the resistor. The current measurement was then performed (column 8) to see if the calculated current actually flows through the resistor. Measurement 0 was made to see if there were really 3.3 volts. The current measurement is omitted here, because there is no closed circuit here. Subsequently, the measurement was carried out 1 to 25. In each case once for the voltage and the current. As the resistance decreases, the voltage decreases. As the resistance decreases, the current increases. As the current increases, the voltage drops. The measurements show that the 3.3V pin has a lower voltage under load than expected. When a current flows, the voltage drops. The actual flowing current remains only slightly behind the calculated current. However, the difference increases from about 0.02 A or 20 mA more and more. The 3.3V pin can be charged only conditionally, because of the current drops the voltage. That is, the 3.3V pin is only partially suitable for the power supply of the external wiring. Subsequent circuit components must therefore be able to manage with less than 3.3 volts or require its own power supply. The extent to which the findings are disadvantageous for a particular circuit depends on the exact requirements and the dimensioning of the circuit.